Introducing to everyone the new tablet computer of Google, the "Nexus 7" tablet, it is manufactured under the Taiwan-based computer brand ASUS. This is the Google's first tablet in the Nexus family. Nexus 7 tablet is available in black or white color, with 8GB and 16GB version. 8GB will be priced at $199 and 16GB for $249. The processor is a quad-core Tegra 3, with 1280 x 800 IPS display, a front view 1.2-megapixel camera, 1GB of RAM, and a 4,325mAh battery. And take note! Nexus 7 tablet will be run by Google's latest Android mobile operating system software, the Android 4.1 or Jelly Bean, that was also introduced along with the tablet. Google's director of product management Hugo Barra said, "We want things to be simple, beautiful and really smart." Google also revealed the "Nexus Q", a small media player powered by Android that can be plug into speakers and TVs to play songs and movies that stored in the cloud, including YouTube. 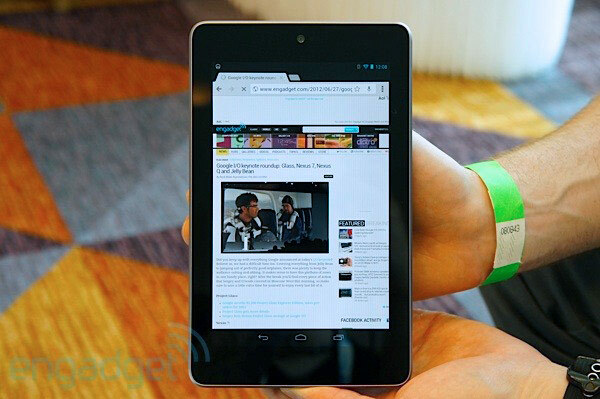 Google hopes more to directly competing with Amazon's Kindle Fire, Apple's iPad and other popular tablets. Shipping is expected within 2 to 3 weeks. Comments or suggestions about "Google Revealed Nexus 7 tablet computer" is important to us, you may share it by using the comment box below.